A beautiful beginning. Simple, intimate, yet with so much promise. I feel like this encapsulates the very vein of the book: a quiet story of the heart framed in blazing adventure. 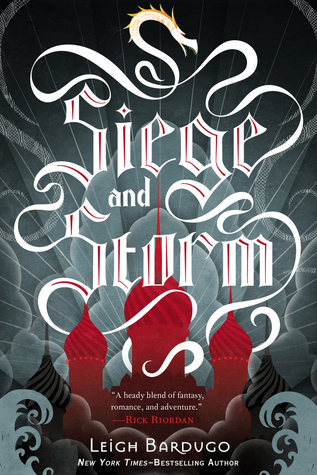 Leigh Bardugo’s Siege and Storm has been garnering praise, and when you read it, you will understand why. Bardugo is a storyteller. She moves words across the page effortlessly as if they have been her friends all her life. She creates imagery appealing to our senses; builds tension and fervor, panic and wonder. She knows how to express a scene, as though she has planted herself right in the middle of it and shows us exactly where and how to look. She does more than tell us, she makes us understand. Which is crucial, as this second installment is, in many ways, as much a psychological journey as it is a physical one. It speaks of religion and the blinding influence it spreads to people desperate for something to believe in. It talks of war, a country torn and slowly degrading. We see and relate to the struggle of families and neighbors as they try to survive. We witness heroes rise and cowards fall as the clock strikes and a person must choose where they stand. The battle is not only on the field, because first you must fight to get yourself on the field. We see this in a number of characters. A privateer of questionable virtue yet with undeniable patriotism. A slave girl who defies despite fear and threat. A score of young men and women who understand the cost of war yet are still willing to fight. Alina’s own battle is just as harrowing. Alina has been tainted by the Darkling. She’s marked. Her light is bound to his darkness. Her struggle is holding on to her good when, at the core, she feels evil, doomed, fated. The question is…can we turn against nature? We see Alina, over and again, choose the right thing, but oh, the Darkling is temptation. The promises oozing from his lips seduce and she is tempted. Worse still, we ourselves are convinced by him. Alina and the Darkling push and pull. Alina and Mal give and take. Herein lies another of Bardugo’s talents. These characters and their interactions are colourful and complex. They fail and succeed. They are honorable and sometimes selfish. Each one is instilled with a solid personality; flawed, authentic. Other high points? The dialogue. High fantasy requires a certain formality in the language but oftentimes they sound saccharine and melodramatic. Never here. Her language flows. It is never awkward and always lovely. Bardugo uses a dictionary of “old words” like skiff and fetter, which I loved. I had to look up a heck of a lot of them but it was worth it. The atmosphere was tangible. I must end here. If I don’t stop myself now, I never will. Just know that Siege and Storm satisfies and justifies. Real things are at stake, real things are sacrificed. I think this delivers as much as any novel can deliver, whatever that may mean. All I know is that I was floored. My brain rates this a 4.5 because, yes, I am still left with question marks. But the rest of me? A METEOR SHOWER OF STARS! Check back here tomorrow and read our exclusive interview with Leigh Bardugo! CAN I JUST SAY — this really is the best middle book ever. I don’t know how she came up with the pacing but… oh boy. Expectations for Book 3 couldn’t be higher (and I’m confident they’ll be met)! Lovely review, K! If I wasn’t dying to read Siege and Storm before, your review would have convinced me to get a copy ASAP to see if I loved it as much as you. What a profound review. I’m a fan of Wendy on goodreads, and that’s how I found your website but I’m impressed by all of your reviews too, I am so intrigued with this book now, I can’t even tell you! A meteor shower of stars, I know the feeling!! Hahaha, my feelings about the Darkling are also full of And yets . . . He’s impossible to dismiss. Oooh, I’m totally anti-Alina and Mal though. He’s just not what she needs now. He’s too used to having the spotlight. It’s all about STURMHONDDDDD. One day I’ll have to try this series, everyone seem to like it! thanks for the great review! Oh man, I’m so excited for this one!! I feel like I should reread Shadow and Bone first because I read it so long ago! Ugh I HATE book amnesia. That’s what I get for reading too many books (but I’m not sorry at all haha). Great review! So, I have a copy of ‘Shadow and Bone’ sitting on my bedside table. Just waiting. Waiting to be read. And I know I’m going to love it, but I can’t bring myself to read it yet? I think I’m saving it for a special occasion – like pulling my out of a reading stump. Your review has me all excited and giddy to crack it open though! I’ll admit that I was pretty on the fence with Shadow and Bone, however your review has made me excited to read Siege and Storm. Plus, it’s being released near my birthday, so yay! I can ask someone else to get this for me as I have no money! A METEOR SHOWER of stars!!! Sounds FABBULOUSSS! Oh great review, makes to really want to pre-oder the book but I’m a beggar currently so maybe later… By the looks of it, this one sounds even better than Shadow and bone. Love the cover to bits!! Haha, aren’t we all book lovers beggars? Yes, this is better than S&B…and S&B was amazing so just think how brilliant this one is!! Enjoy! So sorry K. Loved YOUR review. All 3 of you ladies agree on this one. Yes, we all loved it. And no worries, Tandie! Loved the review Tonya. I’m so hungry for this book! Love-love-love Leigh Bardugo! So yes, I pretty much expected this book to turn out exactly as you’ve mentioned. The set up was there, and I was confident in the execution. But really, the main thing that caught my eye is that you said the ‘dialogue is a stand out’. (paraphrase) To me, that is beyond epic. I’ve been craving a YA book to have excellent dialogue. Something that won’t make my eyes roll. I cannot wait to get my copy! I love good dialogue, too, Vivien. There’s nothing worse than awkward conversations because I feel like that’s when writers really show they’re ‘trying’. It just makes me cringe sometimes. But Bardugo’s words are honey! I can hardly contain my excitement! Bonus: I will be at the beach the week it is released. Can’t imagine a better way to enjoy my vacation than with this book in my hands. I’m just really happy to know that this sequel didn’t disappoint. I’m so excited to learn about how Mal and Alina’s relationship will work out, and if the Darkling will have a change of heart. I’m also eager to meet this Sturmhond. Heard he was a charismatic fella. Thank you, Jehphg. That’s very flattering. Wendy and Tonya are amazing aren’t they? ;) I do write but only a little and only for myself. Anyway, this was a very hard review because I have so much to say. Sometimes I push it but then I think, readers are not going to read this much! So I edit :( But I hope it was helpful, it’s pretty obvious how I felt about S&S. Just thinking about this book (and how much I loved it) makes me want to curl up and sob. You express my own feelings here so perfectly! Leigh Bardugo really is a fantastic storyteller. I agree about her use of language. The attention to detail is stunning, and yes, I did make use of the dictionary too, but it was worth it. God knows what the final book will do to me. Fantastic review, K! *blushes* Thank you, Sam. And you should know that I’ve wanted to marry several of your own reviews, too! I cannot wait for the R&R. I hate having to wait for everything good in liiiiiife! I can’t wait to get my hands on this book. I did everything to try to get an ARC and nothing!! :( Guess I will just have to wait a little bit longer to read it! Oh Angie, I know how you feel! Sometimes I’m absolutely bewildered when some people get arcs of books I didn’t even know arcs had been released for! Well, it isn’t long now. I was a little disappointed on Shadow and Bone, but I hope this will be better! Were you?! Well, as long as you’re interested, I’m happy to announce that S&S does indeed surpass S&B :) Maybe this one will convince you. I think this is my favorite review of Siege and Storm. The way you describe the book and how it made you feel is just so beautifully poetic. I am so happy to hear that Bardugo’s writing becomes even better and stronger in the second book. I cannot wait to read this myself! I really need to start this series. I have the first book but for some reason was being stubborn because the title was too close to Daughter of Smoke and Bone. Karen, it is NOTHING like Daughter of Smoke and Bone. They’re both great books but very different. I love that you pointed out her use of language, K–it was beautifully done, all of it. And I’m sad to say that after this book, The Darkling may be irredeemable in my eyes, too! :( Is there hope for him yet? I have mixed feelings about that, whether it’s yes or no. Your review, as always, is spectacular. Thank you so much, lady darling. Oh Keertana, I would’ve written an essay. This was a hard review because there was so much to say. I thought S&B was really great and this one just improves! I haven’t read this series yet, mostly because for a while I thought the first book was just someone misspelling Smoke and Bone, but I do have it reserved in the library. Haha, Ellen! This series is so good I would forgive that mistake. At least you have it reserved and this series will soon gain a new reader. YAY! So glad you enjoyed the book. I look forward to reading it. Wendy, please. As if you two are not wonderful writers, too. Sometimes I feel like I need to step up because both of your reviews are always so damn profound and fun! Maybe its us pushing each other to be better :) But thank you, humbly. Yes, Erin. Go read now!! Awesome review. I felt the same way and agree on so many points. Thank you so much, Tirta! Now do you promise to start this now? Right now? You must! Awesomeness awaits! I’m so excited for this book! It comes out in a few weeks, I think, and I will be reading it ASAP. Excellent review! I was completely at a loss for what to say about this one, I was too busy fan-girling. :) I loved that this one didn’t disappoint and never even came close to having middle-book syndrome. Cannot wait for the conclusion. Fantastic review! I hope you get everything done so you can read already. This is defintely a book to save and savour…its that good! And the Darkling…there may always be a but with him. This sounds amazing! I have walked by the first book in this series several times at the library, but now I will go check it out. I only skimmed this one because I STILL need to read Shadow & bone (I know, I fail right?) But I am so happy that the series is continuing to be awesome. I am definitely curious about the world building because it sounds out of this world. Jenny, this is truly one of the most satisfying ya series out there right now. I’m glad you skimmed this because reading S&B will be worth it. Enjoy!